(PRWEB) Feb. 27, 2014 ‒ While Italy is known for its delicious food, spectacular scenery and passionate people, prospective visitors may be surprised to find out that it is home to some of the most beautiful and interesting castles in Europe. Prominently featured on the back of the Italian euro one-cent piece, Castel del Monte is one of the more well-known castles in Italy. In 1966 the castle was named a UNESCO World Heritage Site which increased its visibility and brought many visitors to the quaint town of Andria. Built in 1240 by the powerful Frederick II, Holy Roman Emperor and King of Sicily, who had strong ties to Germany and the Middle East, experts say the architecture combines features of both Northern European and Islamic construction. The castle boasts eight octagonal corner towers with eight rooms on each floor around a center courtyard. While the interior of the castle is sparse, the outside is dramatic and, with the backdrop of sun-drenched Puglia countryside, well worth the trip. The castle is open year-round, seven days a week, with extended hours during the summer months. By train: From Rome to Barletta takes about 3½ hours with fares starting at $28. From the Barletta train station you can catch a bus to the castle. Feeling more like half a castle, the ruins of Castle Belfort still strike an imposing and royal stance in the green rolling hills of the Italian province of Trentino. Built in 1311 by Henry I of Tyrol, the castle became home to a succession of ten different ruling families, each putting their own touch on it, over many centuries. It’s surprising the castle is still standing at all. Only the grand fortress and the rectangular outside walls remain, but the political history of warring families and the drama they created is fascinating. In fact, some say the ghost of an embittered and insane Lord still wanders around the castle on rainy nights. Dressed in black and carrying a sword, the jilted lover is still searching for evidence of his wife’s infidelity. That story alone makes it worth the trek. Open year-round to visitors. By train : Belfort Castle is located between the towns of Spormaggiore and Cavedago. The closest train station is Trento from which you can grab a taxi or bus to the castle. Venice to Trento takes about 2½ hours and fares start at $32. One of the largest and most well-preserved castles in Italy is located only about an hour outside of Rome in the town of Bracciano. Odescalchi Castle was built in the 15th century to be used as both a military fortress and house of residence for papal families, including the Borgias and the Orsini, both powerful players during medieval times. Over the centuries it was the subject of many battles between warring noble families, but remains today meticulously restored. The architecture is reflective of the military structures of the Renaissance era with six stately towers surrounding an inside courtyard. Many of the rooms are completely furnished with period pieces and the castle boasts its own museum full of medieval artifacts, plus a spectacular view of Lake Bracciano. The castle is so stunning, it has played host to many high-profile weddings including that of Tom Cruise to Katie Holmes. Hourly tours are offered daily throughout the year. By train : From Roma Ostiense take a regional train to Bracciano. It takes a little over an hour and costs about $5. About ItaliaRail: ItaliaRail are the experts on Italy train tickets and passes. In cooperation with Trenitalia, Italy’s only national railway, ItaliaRail provides a direct connection to Trenitalia’s reservation system allowing rail travelers access to the most routes at the best prices. Travelers are able to book in multiple currencies and knowledgeable customer service agents are available to answer questions and give advice on train travel throughout Italy. ItaliaRail was launched in 2005 and is a division of International Rail, LLC. A panel discussion with the President of the Università degli Studi di Bari Aldo Moro Co-sponsored with the United Pugliesi Federation, the President (Rettore) of the Università degli Studi di Bari Aldo Moro, Professor Antonio Felice Uricchio, will join us for a panel discussion on the rewards of studying and researching abroad. • Opera arias by Pugliese soprano Annalisa Carbonara accompanied by I Due Moderne. • Photo exhibit of the Patron Saints of Puglia and photos of Apulian scenery. A display of the terra cotta whistles of Rutigliano. Opening April 5, 2104, Westchester Italian Cultural Center in Tuckahoe, NY. For further information and updates see the UPF website here. Many travelers may be unaware that Italy’s Region of Puglia is the home of not one, but three UNESCO World Heritage Sites ‒ Castel del Monte, Alberobello and the Sanctuary of Monte San Michele. All three are worth visiting, even if you’re on your first visit to Puglia. Just be aware that all three sites are hugely popular with domestic and international travelers, so it may be best, if your schedule permits, to visit them in the off-season. The sites may be visited independently or with the help of professional tour guides or tour operators. 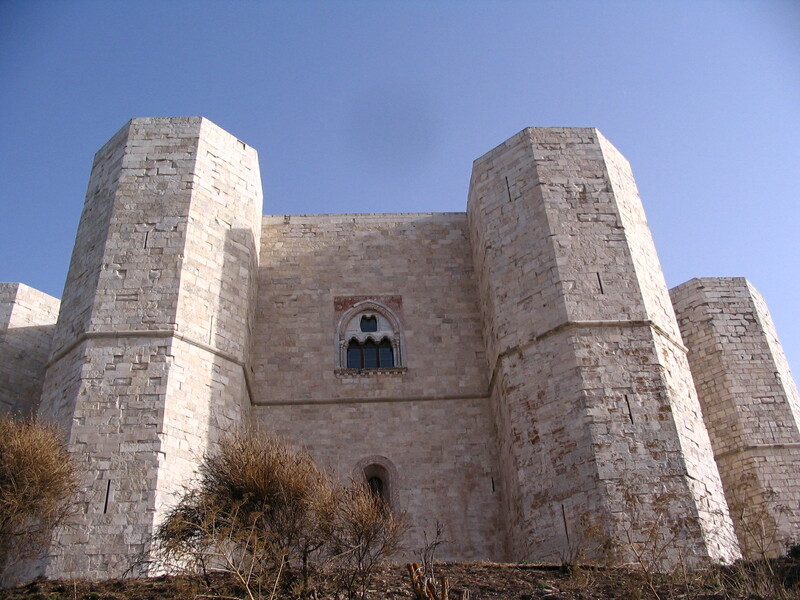 CASTEL DEL MONTE ‒ You cannot miss a visit to this castle, built and commissioned by Frederick II and presumably completed around 1240. Due to its shape and function, Castel del Monte, in Andria, is significantly distinguished from the other castles open to the public in Puglia. The octagonal shape on which the entire building is structured on one side represents a rigorous architectural design, while on the other recalls rather symbolic aspects (probably) that make a visit to the castle even more interesting. It is also worth remembering that in the construction of this castle, whose planning was directly observed by the emperor, Frederick II was inspired by other buildings he visited during the sixth Crusade. ALBEROBELLO ‒ Alberobello is in the southern part of the Province of Bari, near Castellana Grotte, Locorotondo and Putignano. The town was founded in the 15th century by Acquaviva-D’Aragona, two counts of Conversano, on land that was originally an oak forest. A typical feature of Alberobello are the trulli, white dry-stone houses with conical roofs made of lapidary stones. Inside, the trulli have a square central room communicating with the other rooms of the house via arches. Many trulli in Alberobello can be visited and the tallest trullo in the area, Trullo Sovrano, is on two floors and houses a museum. The roofs of the trulli are embellished with decorations and pinnacles of various shapes, often symbolizing religious signs or signs of the zodiac. SANCTUARY OF MONTE SAN MICHELE ‒ The Sanctuary of Monte San Michele in Monte Sant’Angelo, on the Gargano Promontory, is an important point of reference for the whole Christian world; in fact, it has always been a destination for millions of pilgrims who named it the “door to the sky.” The basilica is unique in its genre, since it is almost completely built inside the natural cave where St. Michael the Archangel appeared several times to the bishop, who then decided to found a church there. Next to the sanctuary is the pilgrim’s house, a lodge open to individual visitors and groups in spring and summer. The Puglia Center of America is proud to announce the fourth edition of the Puglia’s Italy Award of Excellence in America, which will take place at the Etcetera Etcetera Restaurant in New York City on March 13, 2014, from 7 to 9 P.M.
Tickets for the awards event are $50. A special dinner with recipes from the Region of Puglia will follow the event from 9 to 11 P.M. (cost is $100). Sponsorship opportunities are available. For information, please call 212-726-2547 or send an email to pugliacenterofamerica@gmail.com. New York City (PRWEB) Feb. 18, 2014 ‒ The Minister of Agriculture for the Region of Puglia, Fabrizio Nardoni, is defending the superior quality of Italian extra-virgin olive oil against counterfeit oil produced in the U.S.
“As one of the major extra-virgin olive oil producing regions, Pugliese growers are the victims of the dangerous trend of Italian-sounding products made in U.S. that have been damaging our economic and entrepreneurial system as these products completely bypasses the appropriate inspections that the European Union members are subject to,” Nardoni said. Together with the Movimento Turismo del Vino Puglia, a consortium of wine producers from the homonymous region, Nardoni was in New York City to promote and support the large variety of wines and olive oils from Puglia at the recent “Raise a Glass to Puglia” event. “All Americans who have been appreciating the wines, olive oils and excellent products from Puglia have been given an instrumental lesson on food quality. They should understand that they are part of a country of counterfeit and unhealthy foods,” Nardoni continued. MILAN (ANSA) ‒ Puglia held up better than the rest of Italy in tourism in 2013: the region has increased its share of the foreign market with a 2% increase in visitor arrivals and a 5% increase in overnight stays. The region also increased its share of Italy’s international tourism markets, from 17.9 % in 2012 to 20.1% in 2013. 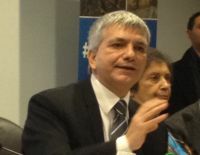 “Puglia is now a now a global tourism brand,” Nichi Vendola, the president of the Region of Puglia, said at the 2014 Milan International Tourism Exchange (BIT). Puglia tourism officials are reporting a favorable reception for the region at the 34th edition of the International Tourism Exchange (commonly known as BIT) in Milan. They also revealed that a survey by the Italian government statistical agency Istat found that Puglia is the favorite destination among Italian families for long summer vacations. In a press release about its success at BIT, the regional tourism agency Pugliapromozione cited Istat findings that Puglia ranks in first place during the summer, followed by Tuscany, Emilia Romagna, Sicily, Sardinia and Trentino Alto Adige. Also, in 2013, Puglia was the region where Italian families most frequently spent long vacations during the spring and also was one of the most visited regions during the autumn. At the trade fair, Puglia join by tourism industry representatives from the regions of Lazio, Sicily, Piedmont, Liguria, Lombardy, Veneto, Emilia Romagna, Marche, Tuscany, Umbria, Basilicata, Campania, Calabria and Sardinia to support their tourism businesses and promote their territories to potential buyers. Also represented are tourism organizations, airlines, hotels and other travel-related agencies and businesses from many other countries. (ANSA) ‒ Rome, February 12 ‒ Italian labor unions on Wednesday announced a nationwide, 24-hour transport strike on March 19. The date was chosen to replace a postponed strike earlier this month. The strike applies to all buses, metros and trams. The Region of Puglia certainly is being proactive about promoting inbound tourism. In its latest international venture, the Regional Tourist Board of Puglia (Puglia Promozione) teamed up with the Italian Embassy in Lebanon this past weekend to showcase Puglia’s cuisine and culture to Lebanese travelers. The event was reported by the Daily Star, a Lebanese-based newspaper. Giuseppe Morabito, the Italian ambassador to Lebanon, told the audience, “Italy is not only Rome, Florence, Venice and Milan for shopping. This is why we try to promote different parts of Italy, starting with the region of Puglia.” The event also was intended to highlight the similarities between Puglia and Lebanon. Geographically, Puglia is the closest Italian region in Italy to Lebanon and they have similar populations. A highlight of the event was a combined cooking demonstration and musical performance by “Donpasta,” who we saw at a Puglia Promozione event in New York City last fall. Read all about the Lebanon event here. Puglia’s creative juices are flowing again. A company created by young engineers in Lecce has developed “Solarino,” described as the world’s first solar-powered robot designed to keep beaches clean. The “quiet and environmentally friendly” robot replaces loud motorized machines that could only be used at dawn and dusk. “The hope is that Italian shore communities understand the importance of Solarino and decide to adopt it for the cleaning of the beaches,” Mauro Della Valle, president of FederBalneari Salento, told La Gazzetta del Mezzogiorno. The website TR News.it says the robot is manufactured by DronyX Srl of San Cassiano in Lecce. 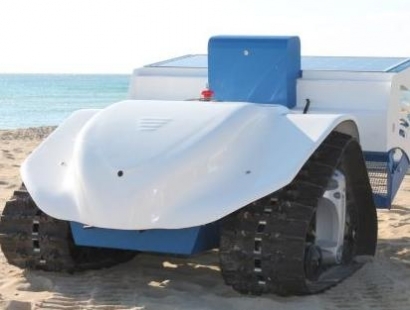 The radio-controlled robot operates solar batteries and can maneuver on both wet and dry sand. You are currently browsing the Puglia Connection Blog blog archives for February, 2014.